Browser developer Opera has launched a free VPN app for Android, allowing you to run apps and visit sites anonymously on your mobile device with ease. 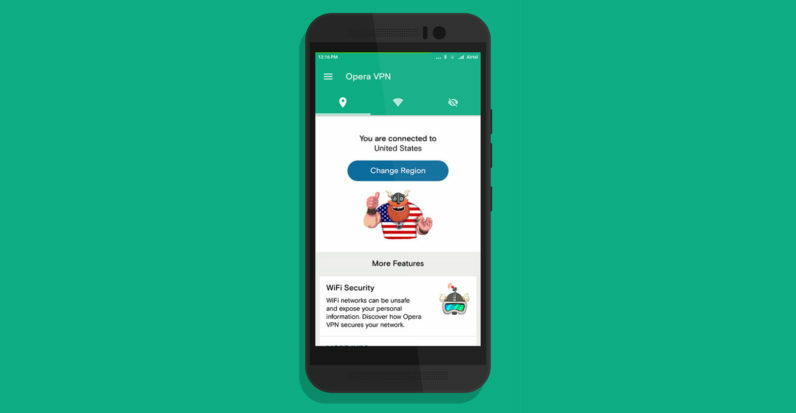 As with its iOS counterpart that was released earlier this year, Opera VPN doesn’t require you to create an account and doesn’t set limits on how much data you consume through the service. It does exactly what it says on the tin. Once you connect to the service through the app, you can browse anonymously without giving away your real IP address and access region-locked content by spoofing your location. There’s also a Wi-Fi test tool that scans the network you’re on to see if it’s encrypted and whether it’s safe to use. If it detects weaknesses, such as the IP address and the location being exposed, or notices that people can grab the details of connected devices, it’ll list those vulnerabilities in a brief report. Opera VPN supports several languages and lets you choose from five server locations, including the US, Canada, Germany, Singapore and The Netherlands. I found that the app works as advertised, and was glad to note that it presented minimal barriers to turning it on and using it. To help cover the cost of providing the service Opera VPN displays advertising and collects anonymous information. It’s important to understand that this is not data about what you do with your phone, but rather this is data about how a large group of people use their phones. It’s very much like taking part in a survey – there is very little value in your personal answers since your answers may not be representative of the larger population. This data is completely anonymized. Houston confirmed that the app doesn’t inject ads into your browsing experience. If you’re keen on a premium VPN service, there are loads of options out there, including SurfEasy’s paid offering. Our network is not dissimilar to an internet service provider. We have 10’s of millions of users around the world who trust our network for the security of their data every month. We operate a redundant global network in 16 countries and preform over 15,000 quality and security checks on our network every hour to ensure that each byte of data is fast, security and private. Opera has a 20-year history of powering the internet. That’s a reputation that we take seriously in the quality of service we provide. The app is available now for free on Google Play.